Industrial production of the Neklinovsky district is represented by three main activities: mining, processing industries (production of chicken meat, fish, soft drinks, liquid processed milk, whole milk products, textiles, sewing, pulp and paper, production of other non-metallic mineral products) and feed and distribution of steam and hot water, water supply. APC-kolkhoz "Limanniy" - production of flour. CJSC "Mius Liman" - cultivation and catch of aquaculture facilities. The company annually recharges the reservoir "Mius Liman" with fish-planting material: yearlings of carp and other herbivorous fish and young pike perch from its own hatchery. The enterprise also has a fleet, a fish processing plant, and a fish feed production station. Most of the caught fish goes through the primary and subsequent processing on the territory of the enterprise. CJSC "Miusskiy Liman" implements only high-quality; ecologically clean fish, grown on natural feeds, which guarantees exceptional taste properties and high quality of products. The company’s products are in demand not only in the Rostov region, but also in Moscow, St. Petersburg, Veliky Novgorod, Pskov, Adler, Astrakhan, as well as in other regions of Russia and abroad. LLC "Aqua-Yug" - a carbonated soft drinks manufacturer. 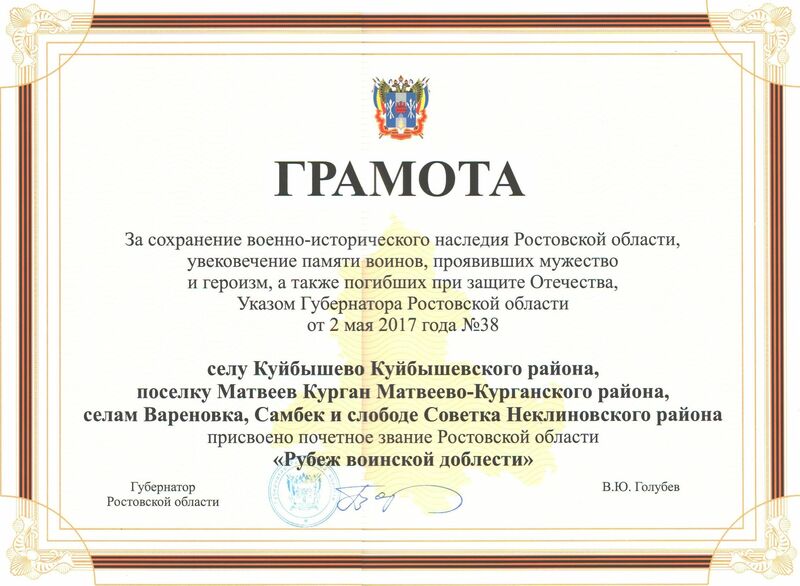 Numerous diplomas, medals, certificates, diplomas of the regional, international competitions and exhibitions confirm the quality of soft drinks LLC “Aqua-Yug”. A special cleaning system allows the company to maintain high quality and purity of water, while retaining the optimum balance of minerals in it. High-quality carbonated drinks are prepared on sugar syrup. In addition to the global re-equipment of production, the company is successfully being rebranded, increasing general sales and boosting the consumer demand. LLC FP "Russkiy Bereg" - a producer of 70 types of products, including frozen fish fillets, whole frozen fish, etc. 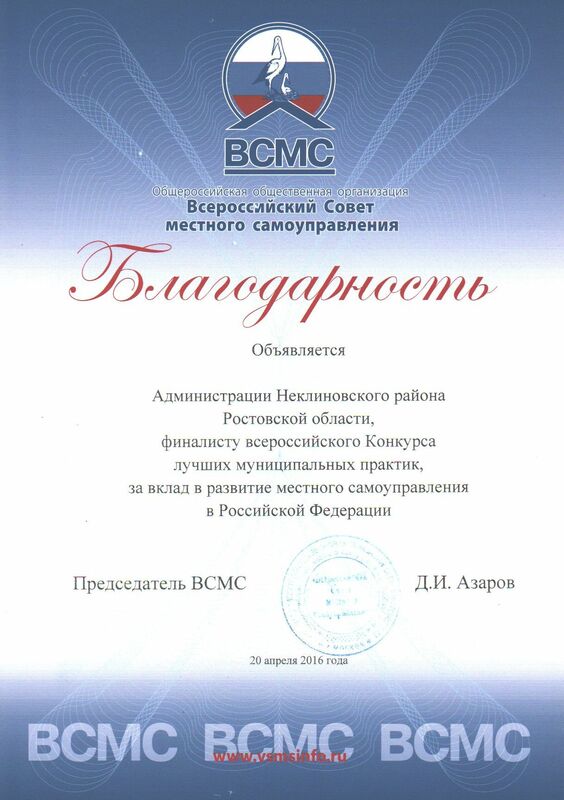 At present, the client network of LLC FP "Russkiy Bereg" consists of 150 clients in various regions of Russia. The clients of the enterprise are both wholesale enterprises and fish processors directly. Thanks to the developed logistics and a wide range of products, the company maintains long-term partnerships with even small customers, purchasing no more than 2-3 tons per month. LLC "Mius-Ceramics" - production of building bricks, etc. Neklinovsky district is an agricultural region from its origin that largely determines its business activities and specialization in the corn farming, vegetable crop, fruit and berry crops, livestock production and fish farming. More than 83% of the region’s territory is land suitable for farming. There are 12 large and medium-sized farms, 111 farm households, and more than 34 thousand private subsidiary farmings that carry on agricultural activities. The yield of grain and leguminous crops, corn and sunflower, the area is in the top three in the Rostov region. About twenty types of agricultural crops are cultivated in the region. Agricultural producers of the Neklinovsky district in 2018 collected 343 thousand tons of grain and leguminous plants. The average grain yield in 2018 was 32.7 c / ha, in 2017 - 52.5 c / ha. Winter wheat threshed 278 thousand tons, representing 90% of the total harvest. The average yield was 35.4 c / ha. 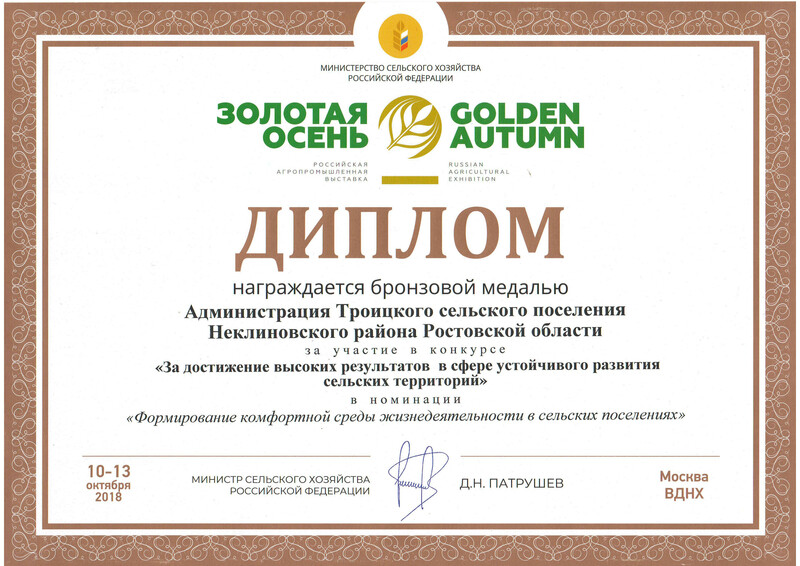 The highest yields were achieved by such farms as OJSC “Taganrog Poultry Plant” - 43.6 c / ha. The best among individual entrepreneurs are Olga Zorina, the yield is 46.4 centners per hectare, and Aleksey Vasilyevich Bortsov — 51.4 centners per hectare. In 2018, 66 thousand tons of sunflower seeds were harvested, the yield was 23.5 centners per hectare, and in 2017, 22 centners per hectare. The index of increasing the yield of grain crops over the past two years has not only been favorable weather conditions, but also sufficient use of elite seeds by the agricultural enterprises of the region. Farms engaging in the production and distribution of the newest varieties of winter wheat in our region are as follows: APC-kolhoz «50 year old October», LLC Helios, individual entrepreneurs Suhomlinova O.V., Deyneka A.I. In total, regional seed-growing farms annually produce up to 7 thousand tons of elite seeds. On an industrial basis in the district, gardening is widespread in the farms OJSC "Zolotaya Kossa", APC-kolhoz "Progress", APC-kolhoz "Limanny" and LLC Rodina. There were planted more than 800 hectares of young gardens over the past 15 years in the district. A special attention to the horticultural industry is paid by the individual entrepreneur - Head of the peasant farm enterprise Kurochkina N.A. In this farm there are 34 hectares of intensive gardens on the espalier with the use of drip irrigation. On the territory of the district there are 5 fruit storages of OJSC " Zolotaya kossa", APC- kolhoz "Limanny", APC-kolhoz "Progress", JSC "Kolkhoz Sovietsky", peasant farm enterprise Kurochkina NA. with a total capacity of 6,650 tons. The livestock farms of the region specialize in dairy and beef cattle breeding, pig breeding, sheep breeding, rabbit breeding and poultry farming. The livestock of large cattle is concentrated in seven large agricultural enterprises/farms. The largest herd of cattle is in APC-kolhoz «50 year old October». In the largest rabbit breeding farm in the Rostov region belonging to the individual entrepreneur Pudyshev R.Yu. there are 15 thousand heads of highly productive breed of rabbits imported from France. One of the best poultry farms of the Russian Federation, OJSC PF “Taganrogskaya" produces 250 million eggs a year. This closed cycle enterprise also produces meat, poultry feed and egg powder. In the region there are also three fishing farms. There is a unique enterprise LLC Bio-Farm Petrovsky operating in the Neklinovsky district. This is a first rural environmentally friendly enterprise in Rostov region, a pioneer in the production of ecologically pure products from spelt wheat, rye, naked oat, linseed, red and green lentil, grown without chemical fertilizers, pesticides, herbicides and insecticides. For the first 9 months of 2018, agricultural producers of the region received 58.86 million rubles of state support in the form of a subsidy. It is believed that it is in the village that the soul of Russia lives. We honor the memory of our ancestors; we preserve our culture and remember our history. Beautiful beaches, ravines, turns of the Mius river, blooming gardens, endless fields, magnificent sunsets on the coast of the Taganrog Bay, the slopes of the "Mius Park", the bend of the Beglitsky Spit – that’s not a full list of things that attracts tourists to our region. Mild climate, fishing, delicious food, hospitality and an amusing dialect of the colorful local population attract tourists here to the Azov Sea. Neklinovsky district is the territory of a pleasant and widely available rest and leisure. Golden beaches of the Azov coast are a great place for sunbathing. Along the estuary and the coast of the bay there are health centers and recreation centers. There is also a three-star club hotel "Golden Fleece". Cozy welcoming atmosphere, friendly staff, new technologies and health-care methods will leave a wonderful impression of staying in such well-known health centers as the sanatorium "Mir"; boarding house "Red landing"; health-improving center "Romashka"; children health center "Sputnik" and a number of others. - International Festival of National Cultures "Shores of Friendship"
- the ecological forum "Green planet"
- International festival competition " The Bridge of Poetic Friendship "
- Interregional festival of the author song "Pokrovsky Zori"
- regional creative project "Pokrovsky Boulevard"
- regional educational forum for high school students "Step into the Future". Neklinovsky district has a developed transport network. On the territory there lies the federal highway A-280 (M-23) "Rostov-on- Don - Taganrog (to the border with Ukraine)", as well as four regional highways: " Taganrog-Pokrovskoe "," Sambek - Matveyev Kurgan - Kuibyshev - Snezhnoe (to the border of Ukraine) "," Taganrog - Beglitsa - route "Rostov-on- Don - Taganrog (to the border with Ukraine)"; " Pokrovskoe - Sovetka - Bolshekrepinskaya (Sovetskaya village). " There are also 10 intermunicipal roads and 982 local roads in the region. The railway line of the North-Caucasian railway Rostov-on- Don-Taganrog- Donetsk passes through the territory of the Neklinovsky district with a total length of 47 km, providing access to Ukraine and communication of the two largest cities of the Rostov region: Rostov-on- Don and Taganrog. Currently, the following types of telecommunications services are provided in the Necklinovsky District: fixed (wire line) telephony, mobile cellular communication, postal communication, etc. The main provider of wire line communication services is PJSC "Rostelecom". The unique infrastructure of the company which includes secure communication channels and data processing centers, as well as great experience in implementation of large projects make this company is a traditional leader of telephony services market, and an absolute leader of the Internet services market. The total number of fixed telephone numbers is over 6200. The mobile operators in the region are MTS, Megafon, Beeline, Tele2. In order to improve the quality of mobile services and expend the coverage, the towers of all mobile operators are being installed. In accordance with the Federal Project "Elimination of the Digital Divide", PJSC "Rostelecom" the Wi-Fi equipment will be installed in 19 settlements with a population of 250 to 500 people of the Neklinovsky district. The main objective of the project is to provide fiber-optic communication lines to eliminate the existing gap in the quality of data service provision transfer for residents of remote settlements. The length of the fiber-optic line at the first stage is 800 kilometers. Wi-Fi points have already been built and put into operation in v. Klyuchnikova Balka and v. Khristoforovka of Polyakovsky rural settlement. Construction is expected to be completed in November 2017. 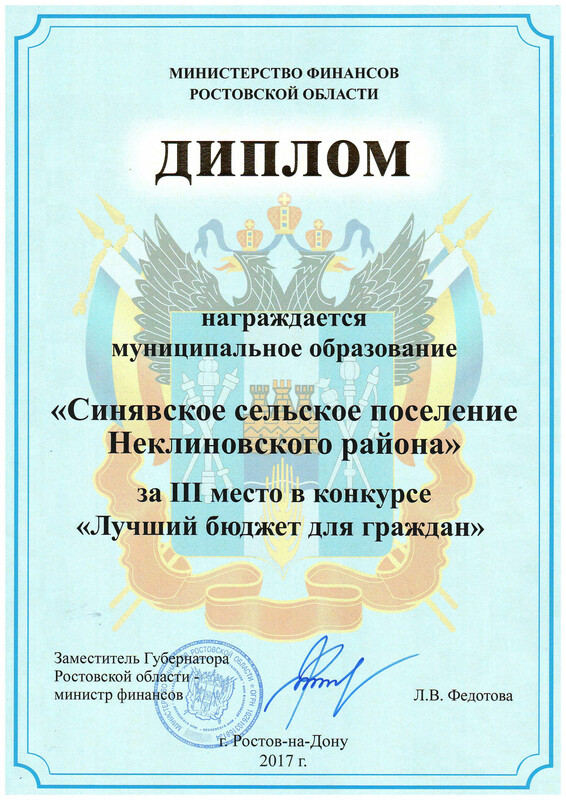 Commercial organizations LLC "Simple Communications" and LLC "Intelcom" are actively upgrading and building fragments of the communication network in the Neklinovsky district. Nowadays, in most settlements in our district, it is already possible to connect subscribers to the Internet using Gepon technology (optics into the house), which allows receiving high-quality communication services. FSUE Russian Post provides "Cyber-mail" services. Most of the farms and production complexes began to actively introduce modern information technologies. A system of active exchange of information resources has been established. 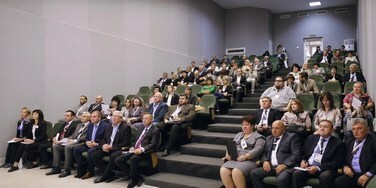 In the AI "MFSC" Neklinovsky district provides state and municipal services to individuals and legal entities on the principle of "one window" at the place of stay. 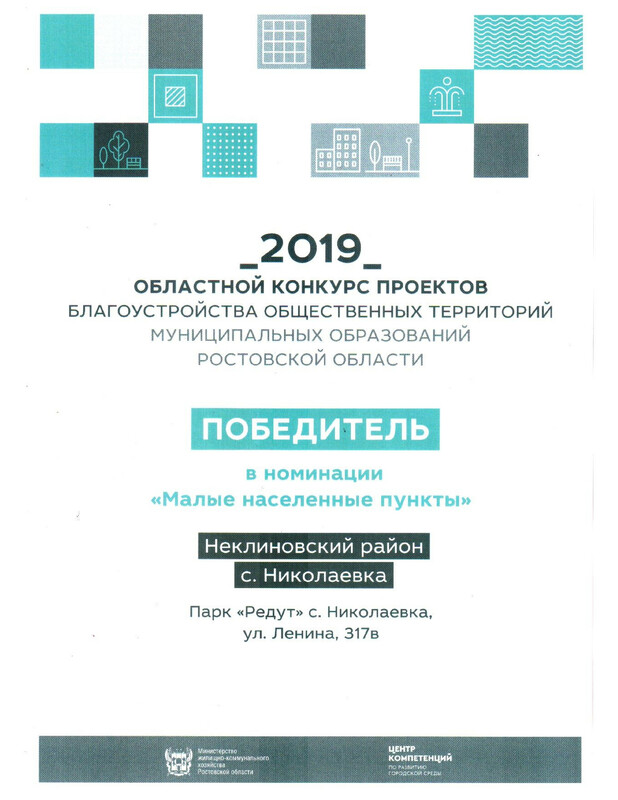 More than 500 municipal services rendered by the departments and structural subdivisions of the Neklinovsky District Administration and rural settlements are electronically available on the Public Services portal. The financial sector of the Neklinovsky district is represented by three banks: PJSC "Sberbank", JSC "Rosselkhozbank" and PJSC CB "Center-Invest". Services for the transfer of funds, payment of pensions and benefits and electronic transfers are carried out by FSUE Russian Post. In large settlements of the district there are operating payment terminals for telephone services, utilities and other payments. A network of ATMs and payment terminals for banking products is being developed. Neklinovsky district is a unique corner of Russia on the climate. This is the only place where acclimatization upon arrival occurs gently and painlessly for residents of the flat areas of Russia. The district is located in the southern zone of the temperate continental climate. During the year, the duration of sunshine varies significantly, reaching the highest indicators in July (315 hours) and the lowest in December (53 hours). In the warm period of the year, the sun shines during 70% of the daylight, and in winter only during 17% (in December). The flat relief favors the free entry of air masses of various origins. The average monthly temperature of the warmest month - July varies from +23.8 C on the shore of Taganrog Bay to +22.8 ° C in the north of the district. On the Bay Coast the absolute minimum is -32 °C, in more continental parts of the region it reaches -34 ° C. The absolute maximum of the temperature throughout the territory is + 40 ° C. The average annual precipitation is 400-650 mm. The largest average annual amount of precipitation is observed in a warm period and is 250-290 mm. The relative air humidity varies in a wide range during the year from 85-90% in November-March to 60-65% in July and August. According to the climatic zoning for construction, the territory of the Neklinovsky district belongs to the subarea IIIB. Sandy beaches, gentle, warm, shallow sea pleases the guests of the district from May to September. Moderate climate and marine ionized air in a combination with steppe herbs create the effect of a natural inhalator. Land is not only the main wealth of any region, but also the source of the revenue side of the budget. Most of the territory of the Neklinovsky district is an agricultural land. Neklinovsky district is a recognized sanatorium-resort and tourist center of the region. Recreational resources of the region are of a great aesthetic, cognitive and recreational value. The number of water bodies attracts recreants for resort recreation, weekend rest, water tourism, fishing and sport hunting. Wonderful sandy beaches of the Taganrog Bay and the availability of collective accommodation facilities contribute to the development of coastal tourism and thalassotherapy on the coast of the Taganrog Bay and the Mius Estuary. The amount of heat in the summer is the same as in the popular resorts of the Black Sea coast. The duration of the bathing season on the Azov coast is 120 - 140 days. The months most appropriate for swimming are July and August, when the water temperature is above 22 C. The thalassotherapy season ends in late September. The mineral and raw materials base of the Neklinovsky district is characterized by the existence of deposits of hydrocarbon raw materials, construction materials. Hydrocarbon raw materials are represented by four small low-pressure gas fields: Azov, Obukhovskoye, Sinyavskoye, Tuzlovsky. Deposits of building materials are represented by brick raw materials and limestone, suitable for the production of building lime. The territory of the region is prospective for the exploration of brick raw materials and building sands deposits. The hydrographic network of the Neklinovsky district is represented by the river Mius, flowing along the central part of the district territory. On the territory of the district there are also the rivers Mokryi and Suhoy Yelanchik in the west and the river Sambek in the east and their tributaries. The river network density is 41 km / km2 in the middle and eastern parts of the region and 0.21-0.30 km / km2 in the western part. Within the district there are more than 60 ponds of different sizes, which are intended for municipal and agricultural water supply, irrigation and fish farming. On the territory of the region, mineral groundwater is practically widespread. There are two main groups of mineral waters: without specific components and properties and water of a specific composition with biologically active components. Underground medicinal and drinking mineral waters are commonly spread at depths of 200-300 m.
The development of mineral water resources for the treatment and drinking is very promising. The Neklinovsky district, like the entire Rostov agglomeration, belongs to low forest areas. The total forest fund of the region is about 5,000 hectares. Neklinovsky district is a part of the Matveyev-Kurgan district forestry of the Kamensk interdistrict department of the Ministry of Nature of the Rostov region. All forests of this territory are assigned to a group of protective forests that have important water protective, sanitary and anti-erosion functions. Have questions or suggestions on the topic of investing? Write, we will be happy!